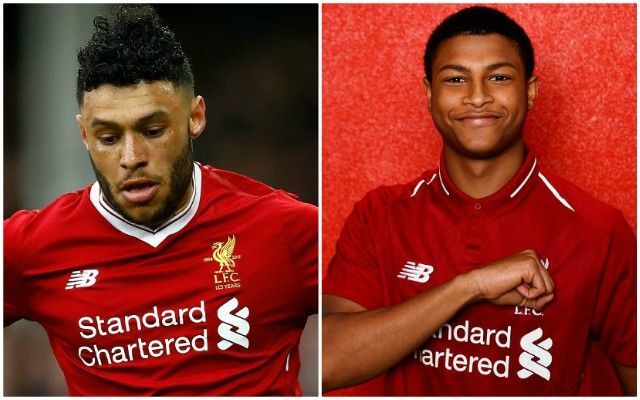 Alex Oxlade-Chamberlain has paid tribute to Rhian Brewster’s positive energy during his recovery from injury. Whilst the midfielder has been undergoing rehabilitation on multiple knee ligament damage, Brewster has been working his way back from injured ankle ligaments. The latter is eyeing a return to training in December and a potential return to competitive action following the turn of the year. As for Oxlade-Chamberlain, it remains doubtful that the former Arsenal man will be fit to make a competitive appearance this season. Nonetheless, early predictions haven’t discouraged the 2017 summer signing from eyeing a surprise cameo towards the end of the campaign. The pair have evidently benefited from one another’s company during their respective processes, with Brewster defying his inexperience to serve as an uplifting influence. An eager, yet patient, wait for Brewster’s return stems from his sparkling reputation within the club’s youth system following a swift rise through the ranks. The 18-year-old had established himself as a prominent figure with the U23s prior to his injury and has already been tipped as a viable option for Jurgen Klopp’s senior team. Brewster earned his promotion to the 23s in the second half of the 2017/2018 season after scoring five goals and supplying four assists in 11 U18 Premier League outings. He wasted no time in making his mark for Neil Critchley’s side as he proceeded to add three goals and another assist in eight Premier League 2 appearances. The extent of his bright impression was amplified in April 2017 when Klopp named him on the bench for Liverpool’s clash with Crystal Palace. This was followed up later in the year when he won the Golden Boot award during England’s winning U17 World Cup campaign in India. Having started the 2017/2018 term with five goals and seven assists in 11 league games, he saw his run of form cruelly cut short in January and has been sidelined ever since. It won’t be long before we see the teenager make his first-team bow.